Growing and retaining your current customers is smart business. Companies that focus on and strive to delight their customers outperform in the marketplace. This may sound obvious, but it frequently gets lost in the daily shuffle of keeping the business going. This paper outlines the characteristics of a Customer Focused Organization and suggests specific techniques to enhance the loyalty of your customers. Success in this endeavor not only helps drive growth with current customers, but it also pays dividends with new customer acquisition efforts. Companies like Southwest Airlines have proven that building value through customer loyalty is a pathway to terrific business success. Southwest engenders loyalty by eliminating perceived customer hassles (like ticket-change and baggage fees), standardizing equipment to improve flight operations, and having an executive team member (SVP Customers) dedicated to the overall customer experience. Southwest weathered the recent recession and even grew its market capitalization to over $10 billion in 2011 while the rest of the airline industry sputtered mightily. Increase wallet-share. New wallet share is revenue that inherently has lower cost associated with it, so it’s higher margin. Drive customer retention. Higher retention means that you are doing less work to grow; the revenue sieve that afflicts most companies has fewer or smaller holes. Transform customers into advocates. Vocal advocates make it much easier to acquire new customers; prospecting is important, but why not make it easy? The starting point in building a Customer Focused Organization is an in-depth answer to the most elementary question: who is your customer? You cannot make customers happy or loyal if you don’t understand their needs, desires, and preferences. Even identifying who the customer is can be complex. Frequently there are multiple audiences to keep in mind. For example, you may want to consider the customer (the entity to whom you are selling), the consumer (the ultimate end-user of the product), and even the shopper (the person buying the product for the end-user). To a packaged-goods manufacturer, Target might be the customer, a mom the shopper, and a teenager the consumer. Regardless of type, every customer must be defined on two levels to be understood. The outer layer starts with the customer’s demographics or firmographics. In the B2B space, characteristics of the company such as geography, line of business, product line, revenues, credit risk, and number of employees are some examples. In the B2C space, customer age, gender, geography, education, ethnicity, and income are relevant demographics. 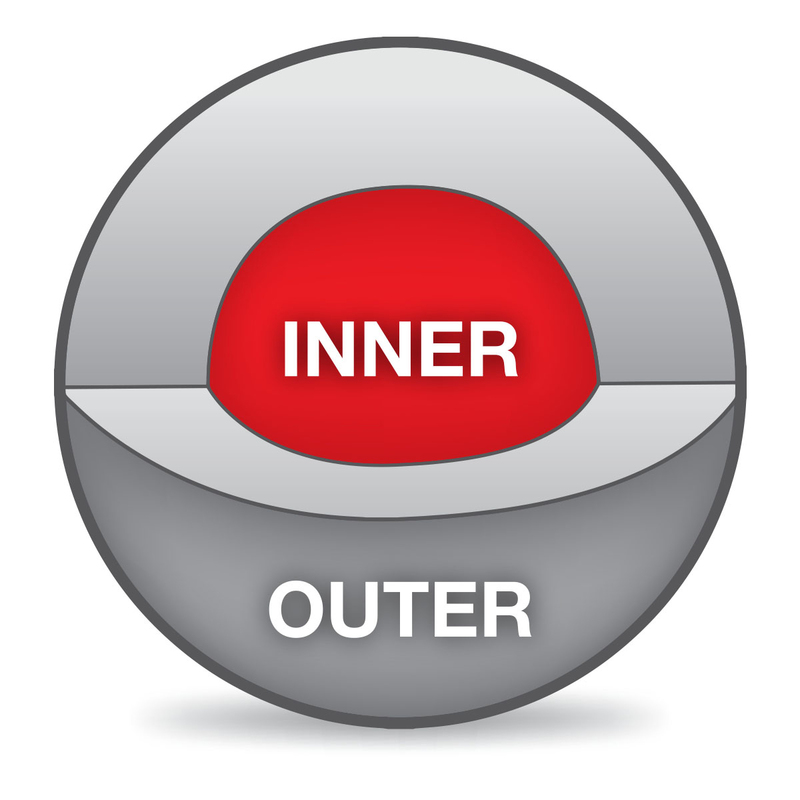 The inner core addresses the customer’s needs, desires, and preferences. It is essential to ask the right questions, listen, and understand what the customer believes is important. Once is not enough; it has to be a continuous dialogue. As time passes, the drivers of customer thrill and pain will evolve. While we don’t have time in this paper to describe all the ways to collect this information, understanding these core motivations is extraordinarily important in building tighter connections with customers. With this in-depth understanding of each customer, you have the tools you need to deal with a business reality: not all customers are created equal. Some are higher margin (they might be easier to serve or willing to pay higher prices); others might provide a larger total pool of profit dollars. Your company’s strategy should define the criticality of each customer type. Then, based on your knowledge of your customers, you can begin working on embracing those customers rationally, emotionally, and experientially. The Golden Rule is “Do unto others as you would have them do to you.” But unless you are exactly the same as your customer, this approach ignores the insights about customer needs and preferences. Establishing the inner-core concept encourages you to treat customers differently, with a touch customized to their needs. A Customer Focused Organization uses the New Golden Rule: “Do unto others as they would like to be treated.” This mindset ensures that the customer’s needs are central, increasing the likelihood of meeting customer expectations as well as thrilling customers over time. This mindset can be applied to all the elements that make up the customer experience – that is, the sum of all touches a customer has with a supplier of goods or services over the duration of their relationship. All touchpoints are relevant – awareness, discovery, attraction, interaction, purchase, use, cultivation, and advocacy. Companies can usually map out dozens of discrete touchpoints, and this can form a framework for organizing efforts to upgrade the customer experience. A Customer Focused Organization begins at the top. The CEO and the executive management team must agree that the customer experience and the pursuit of thrilling the customer are top priorities. They need to form a clear vision for what the customer’s experience should be like and also identify key metrics and behaviors that will be used to measure success against that vision. With management committed, the next step is to communicate this new priority and any new expectations to every employee. Executive management must continually reinforce these messages and establish monitoring procedures to ensure that employees are building the customer experience into their activities. Without this total commitment from management, none of the other elements listed below will stick. Every interaction with the customer is a chance to delight or disappoint. As a result, many of the processes and policies that are put in place need to revolve around the customer, not internal mechanisms. A Customer Focused Organization will tackle each touchpoint or process with the customer in mind. If the process is too slow or convoluted for the customer, then the process should be reengineered. The best organizations will include customers in the reengineering process to make sure the outcome will meet or exceed their needs. Once processes have been established, the next step is to make sure that employees are conforming to the standards. Typically this is accomplished through a training program that teaches the new processes and policies, including system enhancements that require employees to learn new ways of doing transactions. After training is done, it is up to people managers to monitor behaviors and watch for compliance lest old habits reappear. When (not if) processes fail, culture can compensate to thrill the customer. A company’s culture is the ultimate safety net; when it’s properly tuned, failures in the above three elements can be repaired. Customer Focused Organizations have a culture that is fanatical about the customer. Their culture stresses employees doing the right things for customers. Employees that interact with the customer communicate in a prompt and transparent way, for instance, delivering bad news quickly or anticipating the needs of the customer far in advance. A successful customer-centric culture starts by hiring passionate, motivated, creative, and positive team players. Employee education and training are essential; employees must understand that they own segments of the process or touchpoints and are empowered to do the right thing. Their managers must hold employees accountable for their actions. And a customer- centric culture is reinforced with rewards and awards that link back to customer metrics. The Customer Focused Organization engine requires all the above cylinders run smoothly. If any of these elements is dysfunctional, then the entire engine is susceptible to failure, and customers will feel the difference. But when done right, the results can be fantastic. Zappos and Disney are two successful companies that put the customer first. These core values are the basis for hiring, training, and ongoing process improvement. These values are focused on the customer but stress the importance and passion of employees in delivering the ultimate customer experience. Everything that Zappos does comes back to cultivating and celebrating these core values. You can read more in the Zappos Family Culture Book available at ZapposInsights.com/Culture-Book. The Walt Disney Company is the world’s largest media company, with $40 billion in revenue and over 150,000 employees worldwide. Disney is one of the most valuable brands in the world, and it can trace its success to the customer-focused leadership that Walt Disney instilled. Walt understood that being in a guest’s shoes is critical to delivering a “wow” experience. Exceeding customer expectations was Walt’s goal, and he made it clear to all his employees. Walt’s mantra in communicating with employees was pay attention to details, every detail. Walt would attend the amusement rides and measure the consistency and reliability of the rides; he would pay attention to every aspect of the ride experience, including the host of the rides, the lines, and the length of time the rides lasted. To Walt, it was important to experience for himself what the usual customer experienced. He would act as the quality assurance manager and training leader at the same time to ensure a first-rate customer experience. He led by example and empowered every employee to do whatever it takes to thrill guests at Disney attractions. After building a customer-centric engine, true Customer Focused Organizations tune their engine with customer feedback. In Excellence Every Day, Lior Arussy uncovered an interesting fact: 79% of employees said they often go “above and beyond” and exceed customer expectations, yet only 29% of customers agreed. There is a meaningful perception gap between how well employees think they are serving customers and how well customers feel they are served. A methodology is needed to measure, understand, and eliminate this gap. Global consultancy Bain & Company teamed with Satmetrix to create a methodology called the Net Promoter System designed to do just that.2 This approach is a helpful tool that companies can use to tune their customer engines. At the core of the Net Promoter System is the Net Promoter Score (NPS) to measure customer loyalty. The score, which is used by many Fortune 500 companies, is based on a very simple survey. The survey is centered on one key question, “How likely are you to recommend [your company] to a friend or colleague on a scale of 0 to 10?” In addition to this question, follow up questions are often asked to understand the reason for the responder’s decision to recommend or how the company can improve its performance. Promoters (score 9 or 10): Customers are advocates; will passionately refer colleagues and help you build your business. Passives (score 7 or 8): Customers are satisfied but are not vocal advocates; they are vulnerable to be pulled away by competitors. Detractors (score 0-6): Customers are unhappy or not completely satisfied; will spread negative word-of-mouth about your company. To calculate the Net Promoter Score, simply take the percentage of Promoters and subtract the percentage of Detractors. The follow up questions, asking why a Detractor responded negatively or why a customer is a Promoter, are the keys to unlock organizational improvement. Unlike other “satisfaction” metrics, Net Promoter has been quantitatively linked to better bottom-line results. Said another way, there is a positive correlation between higher NPS and better company financial performance. Across many industries, companies with higher NPS have more loyal customers that buy more, stay longer, become advocates, and provide feedback and ideas that propel the organization even further. The Net Promoter Score for an organization is meaningful in two ways: comparing the score with others in the industry, and tracking the organization’s score over time. Every industry has its own NPS dynamics. There are publicly available benchmarks for many industries available from companies like Satmetrix (see Satmetrix.com). For example, in the telecommunications industry, the average NPS score is 11%, with companies ranging from -21% at the low end to 38% at the high end. The negative score means that there are companies that have more Detractors than Promoters; in this environment, a company with an ability to thrill the customer could gain significant market share. In other industries, like retail, the scores are higher, citing more energy spent on customer thrill and a more engaged customer pool. Examples of companies that lead their industries in NPS are USAA (auto insurance), Apple (computer software), American Express (credit cards), and Costco (specialty stores); these companies also tend to lead their industries in growth and profitability. Customer Focused Organizations track metrics like NPS just as they track financial measurements to understand how well they are doing. Monitoring the NPS dashboard makes it possible to gauge improvements or declines in customer engagement. The NPS data also forms the basis for assessing drivers of change and building action plans to improve customer loyalty – all hallmarks of a Customer Focused Organization. Berlin Packaging is a leading supplier of rigid packaging. The packaging market is highly competitive, and Berlin Packaging has succeeded in gaining market share year after year due in part to the emphasis placed on being a Customer Focused Organization. Berlin Packaging’s Chairman and CEO, Andrew Berlin, makes the pursuit of customer thrill a clear priority in all of his communications to internal and external audiences alike. The customer focus is central in Berlin Packaging’s mission statement, which is to increase the net income of Berlin’s customers through packaging products and services. Berlin Packaging has spent significant time and money building and enhancing systems and processes to better serve its customers. PeopleSoft, Berlin Packaging’s award-winning information management system, and ISO 9001 certification are two examples of improvements implemented by the company over the years to deliver better and more reliable customer service. To ensure that processes are done right each time, the company built an award-winning online training system called Berlin Packaging University that educates employees to do their jobs in the best way possible. Managers create training plans and curricula for employees to follow, and employees have access to the programs 24/7. Berlin Packaging has an Anything is Possible™ culture. Employees are hired, trained, and motivated to find ways to say “yes” to customers. “Anything is Possible” is defined and celebrated at the company: We demonstrate more passion and effort – and creatively so and consistently so – compared to our competitors. We go above and beyond in the pursuit of thrill for our customers and success for Berlin. We are the best at what we do. All of this is supported by the Net Promoter methodology. Berlin Packaging uses regular tracking studies to see what’s working and what needs to be improved. 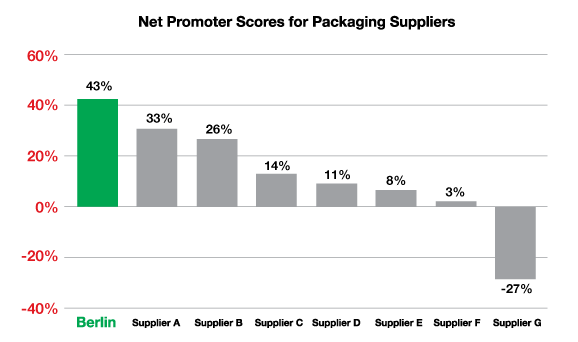 A blind survey done in 2014 by The Parthenon Group showed that Berlin’s NPS led the packaging industry. This confirmed a 2011 blind study done by Bain & Company, which also showed Berlin’s leadership. Planning your business around the customer can lead to more proﬁts for your organization. While it can take time to develop, the following points can help you get started. Ask and answer some simple questions to check your readiness. How robust are your customer performance indicators today? Examine current scorecards for insights and adequacy. Consider satisfaction and loyalty metrics, revenue churn (retention, wallet growth, and new acquisitions), customer tenure trends, and reasons given for defection. How well do you know the customer? Collect information from customer-facing employees such as sales and customer service. Do you have a place where customer conversations and notes are stored for easy employee access? Do you know what delights or disappoints your customers? Do you know the touchpoints that impact the customer the most? List out the ways customers interact with you. Which ones are the most critical in meeting and exceeding customer expectations? Is the pursuit of thrilling the customer the top priority amongst the CEO and executive team? What obstacles does the executive team face in building a Customer Focused Organization? Measure the customer experience by performing a simple Net Promoter Survey in a particular branch or division. Use this to identify some quick hits and also as a jumping-off point for a broader, deeper initiative. Growing and retaining your current customers is smart business. Companies that focus on and strive to delight their customers outperform in the marketplace. We call these Customer Focused Organizations. This competence takes time to develop. It starts with setting priorities and seeing the forest (a thrilling relationship with a customer) for the trees (internal processes, company politics, ﬂavor-of-the-day tactics and other distractions from the core mission). It requires an understanding of who the customer is, including the obvious demographics or ﬁrmographics as well as the inner motivations and desires. Also required is the proper mindset – one focused on solutions tailored to the customer. Clear leadership, robust processes, and a customer-oriented culture are all part of building the engine. Finally, a dashboard to track customer engagement, like the Net Promoter System, is essential. When all these pieces come together, the results can be powerful. Companies that have committed themselves to these principles form a Who’s Who of growth and success and provide a roadmap for others seeking to build better businesses. 1The Loyalty Effect: The Hidden Force Behind Growth, Proﬁts and Lasting Value, Fred Reichheld. 2 Net Promoter, Net Promoter Score, and NPS are trademarks of Satmetrix Systems, Inc., Bain & Company, Inc., and Fred Reichheld.